Whether you're an entrepreneur, freelancer, or executive, you probably have a lot on your plate right now. On top of never-ending tasks, projects, emails, meetings, and deadlines, you might even find it increasingly difficult to produce consistent high quality work amidst living in our highly connected, extremely competitive, and distraction-filled world. In order to stand out, become the best at what you do, and live a life of meaningful pursuits, bestselling author Cal Newport proposes a shift in work mentality—limit spending your time and energy on "shallow work" and focus on "deep work" instead. 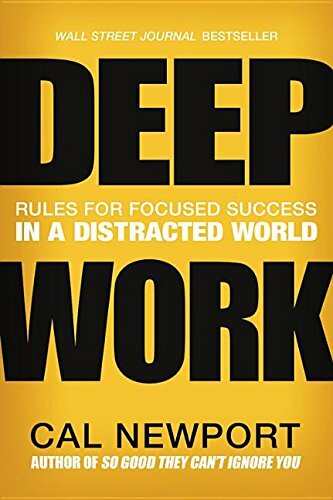 In Deep Work: Rules for Focused Success in a Distracted World, he breaks down the importance of intense concentration, how it can help you achieve your biggest goals, and ways to cultivate it to not only survive but also thrive in today's environment. If you consider any kind of work that we treat as important or highly valuable, it's most likely attained or produced through extreme focus, discipline, and concentration—the very essence of deep work. Whether it's publishing a bestselling novel, completing an award-winning research, or inventing groundbreaking technology, all of these are usually the hardest to create and most time- and energy-consuming to produce. Almost no one could copy it, these stand the test of time, and these make the biggest impact in people's lives. "Non-cognitively demanding, logistical-style tasks, often performed while distracted. These efforts tend to not create much new value in the world and are easy to replicate." Unfortunately, many people spend most of their efforts on shallow work. They multitask, give in to distractions, and give the same amount of time and energy towards any and all tasks they encounter. They produce mediocre results and contribute less to society and the environment. Looking at the bigger picture, this kind of work doesn't lead to creating significant or lasting change. Many people, therefore, feel unfulfilled, are left behind, and don't attain the success that they want or deserve. So while deep work is valuable, rare, and meaningful, it is possible to cultivate it according to the author by following four rules: work deeply, embrace boredom, quit social media, and drain the shallows. It's all too tempting to simply read about how important deep work is, and then brush it off. With so many tasks, projects, and deadlines vying for our time and energy, it's easier to just cross them off our checklists one after the other. They all need to get done at some point anyway, right? We all still need to read and answer emails, attend meetings, create slideshow presentations, do house chores, etc. But again, this is why it's critical to remember what makes deep work valuable, rare, and meaningful. While deep work and shallow work are essential to generating impactful results while maintaining balance in all aspects of your life, it's possible to make time for both by scheduling them. Once you've allocated a specific time slot in your calendar solely dedicated to a specific activity, the greater chances it gets done. It'll be easier to say "yes" to what's truly important in the moment and "no" or "later" to what's not. Through scheduling, you'll be able to focus on deep work when you need to the most and still have the bandwidth to knock out shallow work after. As we mentioned, deep work is required to move our biggest goals forward. And as we prioritize it, we should also come up with ways to maximize the time and effort we put into it by developing routines and rituals. Scheduling deep work is one step but we could also consider the following: Do you like to work alone or in groups? Do you prefer to allocate a few hours a day or maybe entire days, weeks, or seasons for it? Do you have a designated area wherein you work best? How can you design your environment to be more conducive for deep work while avoiding distractions and multitasking? It might be difficult or uneasy for anyone to establish these at first but as with all kinds of routines and rituals, it will become easier and it will strengthen over time and the rewards will come back to you tenfold. Deep Work is an insightful book on the importance of focus and concentration in both our work and personal lives. While some sections may seem extreme (ex. quit social media), the author does note that some tips can be highly advantageous for some people (ex. writers and professors) but may not necessarily work for others. It's still up to us to identify which strategies we can use to incorporate deep work into our lives given our unique situations. Cal Newport's bestseller is full of tips, stories, and research and I highly recommend it if you want to develop deep work (no matter how busy you are or how long your to-do list is) and if you want to discover what you stand to gain once you do. Share in the comments below: What did you find most useful from this article/book? When and how long will you add 'deep work' into your schedule? How often do you find yourself giving in to 'shallow work'?